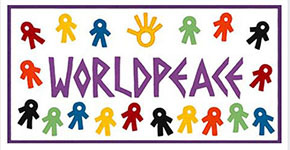 WorldPeace is one word ! ZIONIST ISRAEL - This section is being edited right now. As always, I repeat, I am not against Jews but Zionists, not against Germans but Nazis, not against American Southerners but against the KKK. When Jesus was crucified, the veil that closed off the Holy of Holies was rent in two. That has been interpreted to mean that God removed his presence from the Zionist. He left Israel. 40 years later the Temple of Solomon was razed by the Romans and the Jews disbursed out of Israel. In the 500’s, God spoke to Muhammed the progeny of Ismael. God gave Israel to the Muslims and the Temple Mount to the Muslims upon which now stands the Dome of the Rock and the Al Aqsa Mosque. So the factual history is that not only did God allow the Romans to destroy the Second Temple of Solomon, and disburse the Jews, he gave Israel to the Muslims and he gave them the Temple Mount. THESE ARE THE HISTORICAL FACTS and good indicators of God’s intent regarding the Jews. The Cult Jews think the resurrection and the idea that Jesus is the Messiah is a joke. God allowed the Nazis to exterminate 6 million Jews the same way he allowed the Romans to destroy the Temple of Solomon and disburse the Jews. Now Jesus was born a Jew, lived as a Jew, was a Rabbi, died as a Jew. Jesus established no Church. Paul did that. The Jews are not the Chosen People of God. The Christians are the Chosen people of God through Jesus Christ a Jew. The point is that the original Christians were actually Jewish Christians led by Peter. Paul was converted and went to the Gentiles. In 100, the Jewish Christians either gave up Jesus or no longer could enter the synagogs. That ended the Jewish branch of Christianity and the Gentiles took over. The Catholic Pope should have been Paul not the successors of Peter whose mission to the Jews failed. Paul wrote his letters and he significantly influenced the writing of Matthew, Mark, and Luke because the writers were Paul’s disciples. Paul's place in the building of the Christian Church is much greater than Peter's. The point is that the original Christians were actually Jewish Christians led by Peter. Paul was converted and went to the Gentiles. In 100, the Jewish Christians either gave up Jesus or no longer could enter the synagogs. That ended the Jewish branch of Christianity and the Gentiles took over. The Catholic Pope should have been Paul not the successors of Peter whose mission to the Jews failed. Paul wrote his letters and he significantly influenced the writing of Matthew, Mark, and Luke because the writers were Paul’s disciples. His place in the New Testament is much greater than the Catholic church has ever acknowledged. So the present day cult Judaism is the dead branch and Christianity is the live branch of the old archaic, anachonistic cult of Judaism. Through Jesus, the Christian form of Judaism became the main branch of Judaism. Backing up. Abraham had two sons. Ismael and Isaac. Ismael was the first born. God told Sarah the mother of Isaac and Hagar the mother of Ismael that the progeny of their sons would be without number through two different metaphors. In the 500’s, God spoke to Muhammed the progeny of Ismael. God gave Israel to the Muslims and the Temple Mount to the Muslims upon which now stands the Dome of the Rock and the Al Aqsa Mosque. The pre-eminent Christian nation is America. Jesus said, “Do unto others as you would have done unto you”. The foundation of America is “All men are created equal under the law” These two things are the same. America is the New Jerusalem. America is a nation where all races, all nationalities, all religions live in peace. The only nation in the world like that. America is the light of the world. America is proof that the whole world can live in peace if they embrace an all-inclusive democracy as opposed to the elite exclusionary mindsets that exists in all religions, all nations, and all races. My signature statement: “How can we increase the level of peace on earth if we do not include everyone (all races, all religions, all nationalities, and all genders) in our vision of peace? Right now we have Christian Nationalism that claims to promote God’s agenda by supporting a president that is breaking God’s laws. John the Baptist said make straight the way of the Lord. You make straight the way of the Lord by obeying the 10 commandments. You make the way of the Lord crooked by giving TRUMP a pass on at least 9 of the 10 commandments. God is not working through a man who mocks his commandments. You cannot promote God’s agenda by breaking God’s laws!!! Jesus said a house divided cannot stand. Zionism is the tail that wags the American Dog. For TRUMP and the Evangelical Christians to support the Jews, is contrary to what God seems to be doing with the Jews. The evangelical Christians are the Chosen People of God with all Christians and they are delusional to give their inheritance from God through Jesus to the archaic cult of ancient Judaism. John the Baptist said make straight the way of the Lord. You make straight the way of the Lord by obeying the 10 commandments. You make the way of the Lord crooked by giving TRUMP a pass on at least 5 of the 10 commandments. God is not working through a man who mocks his commandments. You cannot promote God’s agenda by breaking God’s laws!!! For the Americans through Harry Truman to have established the nation of Israel by recognition was against what God has been doing to the Jews for the last 2000 years. For TRUMP and the Evangelical Christians to support the Jews, is contrary to what God seems to be doing with the Jews. The evangelical Christians are the Chosen People of God with all Christians and they are insane to give their inheritance from God through Jesus to the Jews. The Zionist treatment of the Muslims is a repeat of the story of Cain and Abel. With the Jews being Cain and the Muslims being Abel. Both are Semitic people. They are half brothers by virtue of having one father Abraham. The Jews acuse the world of being anti-Semitic but there are no greater and more vicious anti-Semitic people than the Jews in their treatment of the Palestinians. Friends every time I see a story about Israel lighting up Palestine I will post the same response. 1) Israel is an apartheid state where Jews have frist class citizenship and Palestinans, Arabs, Muslims have second class citizenship. America is anti-Apartheid States. 2) Zionists are ethnically cleamsing Palestine of Palestinians. 3) Zionists are maintaining a Nazi concentration camp in Gaza where they deprive the 2 million Palestinians there of food, water, electricity, economic investment from the outside. 4) Zionist illegally per Interenational law annex occupied territories of Palestinians. 5) Zionist exterminate Palestinians like rats in Gaza. It is the national sport of Zionism. Israel is an apartheid state, an anathema to American democracy. Israel is maintaining a concentration camp for 2 million Palestinians in Gaza. Israel is maintaining vicariously 58 Refugee camps which are pseudo concentration camps for Palestinians throughout the Middle East. The Jews cry about the Nazi holocaust to the Jews and deny the Zionist holocaust of the Palestinians. The Jews think the resurrection and the idea that Jesus is the Messiah is a joke. God allowed the Nazis to exterminate 6 million Jews the same way he allowed the Romans to destroy the Temple of Solomon and disburse the Jews. The Zionist are illegally annexing the Occupied Territories. Israel is an apartheid state, an anathema to American democracy. Israel is maintaining a concentration camp for 2 million Palestinians in Gaza. Israel is maintaining vicariously 58 Refugee camps which are pseudo concentration camps for Palestinians throughout the Middle East. The Jews cry about the Nazi holocaust to the Jews and deny the Zionist holocaust of the Palestinians. The Zionist are illegally annexing the Occupied Territories. The Jews are no longer the Chosen People of God. The Christians are the Chosen people of God through Jesus Christ a Jew. For the Americans through Harry Truman to have established the nation of Israel by recognition was against what God has been doing to the Jews for the last 2000 years. Anyone who buys Israeli goods made in the occupied territories owns the above acts. God has blessed both Muslim and Christians and cursed the contemporary anachronistic cult of ancient Zionism.